Need a last minute gift or struggling to decide upon a design or colour scheme for someone else? A Gift Voucher is the perfect solution. Valid for 12 months, they can be used multiple times until the balance is used up. All deductions are made before postage is added and vouchers cannot be used against postage costs. 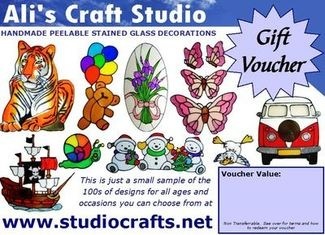 Vouchers can be used for purchases online, at our stall at craft fairs or for mail order sales from Ali's Craft Studio and full details are included with each voucher sold. A great gift for friends and family of all ages no matter where they live in the world!